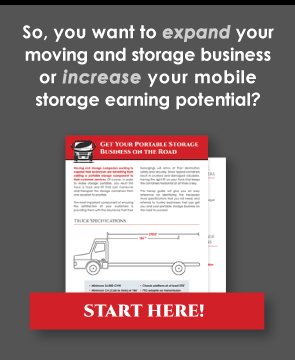 Marketing a mobile storage business can be fun and exciting. As you begin your marketing efforts, take the following ideas and tips into account. Each can help you formulate a marketing plan that can take your business to the top. How do you mobilize it? You make it mobile by making sure your company logo and contact information are clearly visible on your mobile storage containers. Make sure it is easy to recognize and large enough to be seen at a distance. When you are writing your marketing materials, teach your clients what mobile storage is and what it can do to make their lives better. Think of all the things they can store and tell them how you can store it and keep it safe until they need it again. Remember, your greatest selling points are the needs you fill. Live in a college town? If you do, launch campaigns in April and May that are geared towards recent graduates. Live near a military base? Then focus your campaigns on the convenience and speed with which mobile storage can make deployments and transfers a breeze. Real estate agents, apartment managers, builders, architects, and remodeling professionals are your best friends. They can spread the word to their clients who are in direct need of your services. The more they know about your business, the more likely they will be to recommend your mobile storage solutions on your behalf. Want to boost the effects of your networking? It’s easy to do with an affiliate program. An affiliate program provides tangible financial rewards that can quickly increase the number of clients your affiliates send your way. Satisfied customers can become eager affiliates too. Offering discounts and other incentives for referrals gives them a valuable reason to continue using your mobile storage solutions. Set up a booth at the County Fair. Sponsor local charities, school activities, and community events. A business that is active in the community is a business that has a vested interest in the community. Potential clients will see this, recognize it, and reward you with their business. Sites like Groupon make it easy to offer deep discounts, but you don’t want to sell yourself short. Many consumers see deep discounts as a sign that a company’s products/services are overpriced to begin with. Offer coupons regularly, but limit the value of your discounts when doing so. Tie your brochures, social media profiles, radio adverts, door hangars, etc. together. Make sure that the message, style, tone, and graphics are consistent across the board. A uniform marketing message creates consistency, and consistency creates trust. Good signage, visible security features, and a well-maintained property are some of the best advertising around. These show a dedication to the business and provide visual cues that show how well you will take care of customer’s property while it is in storage. If a picture is worth a thousand words, a well-maintained property is worth a thousand clients. These tips and ideas can go a long way as you go about marketing your mobile storage business. Each one is a component of an effective and efficient marketing machine. The longer you employ these into your marketing efforts, the greater the impact will be on your business’s bottom line.